ISO 4406 Lubricant cleanliness is critical to establishing equipment reliability. There is a direct correlation between lubricant cleanliness and component life, and clean oil can extend your equipment life by up to 5 times. ISO 4406 is the best and most widely used oil analysis method for measuring particle size and concentration. As equipment wear advances, the size and concentration of wear particles in the equipment’s oil also increases. 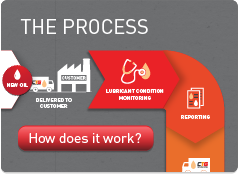 A laboratory oil analysis report to ISO 4406 standard empowers customers to monitor their lubricants ISO cleanliness. The ISO 4406 standard utilises a three number system to classify system cleanliness. Microscopic images of various contamination levels. Contact CTG to start testing your lubricant cleanliness and to find out the benefits that cleaner oil can provide for your equipment reliability.